So by virtue of being Japanese tapas, we already knew that it would be expensive and not very filling. Lucky for me, Milhouse had spotted me a pack of the Traveller's Deck, which incidentally had a card for 15% off. Much like Kevin's visit, this really helps the bottom line. Knowing this, we set out ordering several dishes to be satisfied without completely taking advantage of Krazi's generosity. We started with one of her choices, the Papaya Roll which consisted of papaya, crab cake, cucumber, lettuce, avocado and mayo. 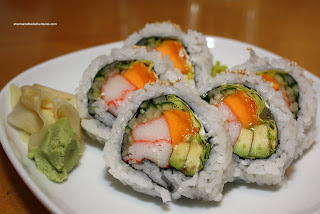 I'm not a huge fan of papaya; but this roll was quite good. All of the other ingredients worked together to temper the papaya taste. Nothing particularly interesting about this roll. The rice was pretty good though being chewy with some flavour. 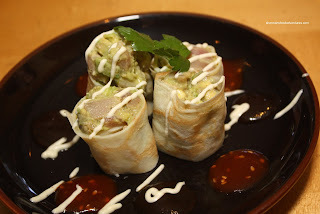 Arriving next was the Maguro Avocado Crepe. Although I liked the understated sweet taste of the roll itself, it was a ball of mush in my mouth. The sweet and spicy sauce on the plate added some flavour to the otherwise mild tasting roll. The King Oyster Mushroom Salad was a fine choice by Costanza. Originally, Krazi and I thought the balsamic d ressing might be too salty; however, as we ate it, that was exactly what the salad needed. 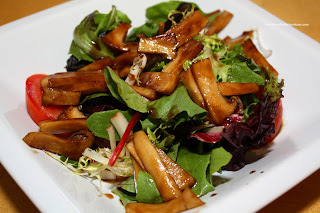 Lots of flavour and mushroom taste to accent the spring mix. The Beef Tataki is a pretty standard dish offered in most Japanese restaurants. It is a tricky thing to execute even though it seems quite easy. 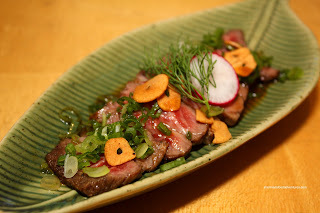 Well, I've had my share of chewy tataki, so it is not as easy as it seems. Essentially barely-seared beef sliced thin, this version rested on a bed of julienned Fuji apple and dressed with a ponzu citrus sauce. I liked the combination of the salty and tart from the sauce mingling with the apple; however, the star of the show failed. The beef was quite chewy and tough. The meat was actually well-marbled and I could only hypothesize that the uncooked fat was making it chewy. 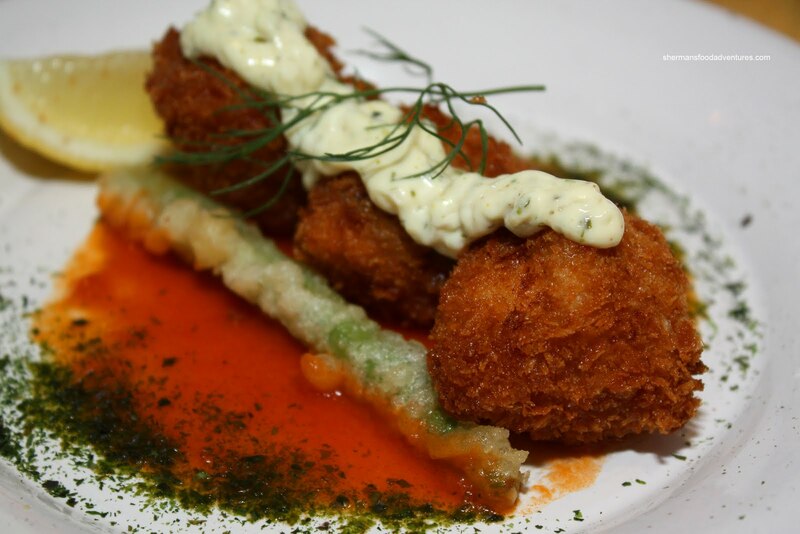 One item that caught most people's attention was the Panko Fried Halibut Cheeks wrapped in Bacon. C'mon, its wrapped in bacon and fried! Who wouldn't like that? Oh darn, we were supposed to eat healthy right? Ah screw it! So the dish was comprised of 3 fried cheeks resting on a spicy tomato sauce with tartar sauce drizzled on top. Probably due to the small size of "balls", the halibut was a tad overcooked. 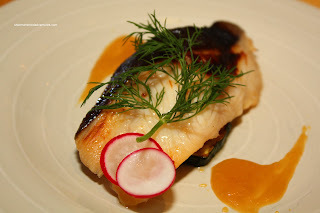 By its v ery nature, halibut cheeks (as with most cheeks of anything) are slightly chewy. This was no different and in fact, the bacon made it even chewier (not really a detriment in this case). I found the tomato sauce to be rather bland and not spicy at all. I did like the tartar sauce though. A good ol' standby is the Grilled Sablefish. It is a very forgiving fish and to mess it up is quite difficult to do (however, I've seen it). This particular version was marinated in miso, sake & mirin. In the menu, it states "grilled to perfection" and I can't disagree with that. The fish was moist, maintained its integrity and flavoured just enough. To further deteriorate our 'healthier" meal, I decided to order Yuji's Fish & Chips which consisted of fried white fish and sweet potato fries. This was a fairly large dish comparatively to the others with 5 pieces of fish. It was accompanied by 3 dipping sauces - spicy ketchup, tartar & soy ginger. I thought the light tempura coating was fried perfectly. It gave a nice crunch to the tender fish and soft sweet potatoes. Of the 3 sauces, I liked the tartar the best. I wasn't a huge fan of the soy ginger. It was too powerful (salty) and even a small dab would overwhelm anything dipped into it. I guess when I selected the Sweet Potato Tempura Sticks, it didn't dawn on me that those would be the same "chips" found in the fish & chips. With what was essentially a few more fries than the fish & chips order and only being $2.00 less, you figure out which was a better deal. 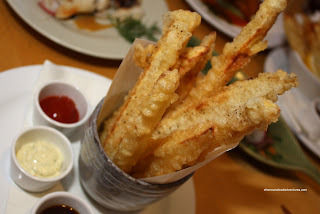 With that being said, these tempura fries were very good - crisp on the outside and tender on the inside. 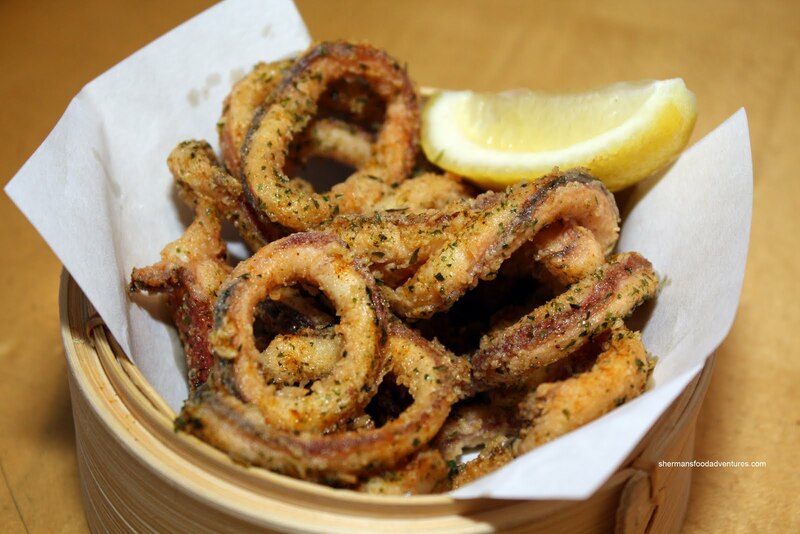 Another winner of a dish was chosen by Costanza which was the Spicy Curry Calamari. In addition to being fried perfectly with tender squid and a crisp exterior, I really liked the addition of nori in the batter. I noticed that flavour more so than the curry. It really wasn't spicy at all; rather it was sweet and seaweedy (not really a word, I know...). 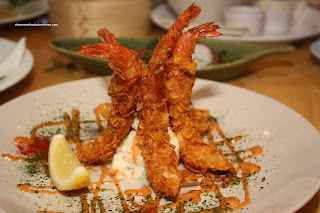 Another pretty standard item found at these types of places is the Ebi Mayo. However, Yuji's twist on this is the Corn Flaked Prawn Karaage. So rather than a tempura batter, we have corn flakes which makes the fried prawn appreciably crunchier. 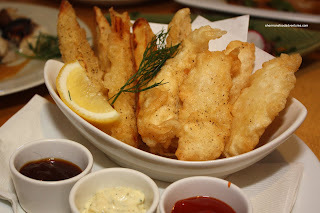 These were fried perfectly with a moist prawn on the inside and the aforementioned c runchy coating. A mushy potato salad was plated underneath the prawns. This was mostly an afterthought. A mild-tasting sesame mayo was drizzled on the plate. At this point, the food in general was pretty solid, if not unexciting. 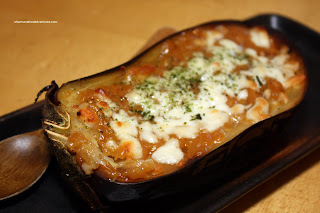 Then, the Baked Eggplant "Yuzu" Miso Mozzarella Cheese arrived. Presented as half of a large eggplant, it sure looked impressive. After one spoonful of the soft flesh, I was hooked. The flavours soaked up by the eggplant were strong and assertive. I got good hits of salty from the miso, slight tartness from the yuzu and the natural sweetness of the eggplant. Of course the cheese added some body to the dish and a bunch of oil too... The Grilled Duck Breast arrived much later. Probably almost 10 minutes after the eggplant. We nearly forgot about it. Thank goodness they didn't because it was pretty darn good. Slightly on the more cooked side, the duck was still very moist and tender. It was dressed with a balsamic reduction and cooked leeks. 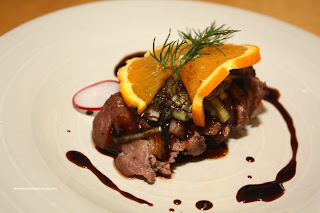 We thought the sweet balsamic combined with the leeks offered up a really nice rich and fresh (at the same time) flavour to the meaty duck (and skin). While not exactly inexpensive, I didn't find the prices to be out of line for a tapas/Izakaya-type joint. Sure, some portions were smaller than others; but that is to be expected. In terms of overall food execution, it was more than acceptable with some highlights. It really helped that we had the 15% discount as well. I know it isn't exactly an equal comparison to places such as Guu and Hapa (possibly more with Kingyo); yet Yuji's is indeed more expensive. 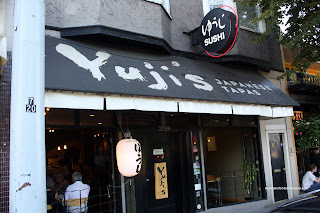 In terms of overall execution and care, Yuji's has the edge. Hence, once again, it really would be what you value more in terms of picking one or the other.